After so many daughters, having a son is a little surprising sometimes. Apparently boys are different from girls even in illness. Little Girl lay on the couch with a bucket nearby and looked pitiful, drifting in and out of sleep and getting a little whiny for a couple of days, which is how her sisters had always reacted to sickness. Little Boy careened around the room clutching his stomach, yelling, “MY TUMMY HURTS!” Then he would settle on the couch for a minute or two before getting up and lurching about again. “MY TUMMY!! MY TUMMY! !” he would scream, and then lie down briefly on a different couch, or a chair, or the floor. He did this for several hours. I don’t know if I can survive boy-sickness. Our cat has a urinary infection of some kind. My husband took him to the vet after we had noticed he was peeing on the floor and continually licking himself in an –ahem– delicate area. The cat, I mean. My husband almost never pees on the floor. I received the following text while the two of them were at the vet clinic. I’m not sure which one of them sent it. In any case, now the cat has to take an antibiotic. Meaning, my husband has to catch him and force a pill down his throat twice a day. Unfortunately, he gave the cat the first dose on our bed. Which is now covered in cat pee. This is either due to feline revenge, or as a symptom of the cat’s illness. My husband and I went out to dinner last weekend. Like everyone else on earth, apparently. I thought if we went the day AFTER Valentine’s we would miss the crowd, so we waited until Saturday night. There was over an hour wait for a table, so I guess the crowd was still there. Me: This is SO boring. Him: Yeah. What time is it? Me: Like one minute after I last checked the time. Me: You want to talk about something? Me: So go ahead then. Him; I was waiting for you to start. Me: I should have looked up those interview questions. Me: At my ladies’ group last week, the chaplain came and told us how we could strengthen our relationships with our husbands by interviewing each other. Him: You want me to interview you? Me: Well, yeah. But I forgot to look up the questions. Him: That’s okay. I do interviews all the time at work. Him: Yeah. You want me to interview you? Him: (putting on a serious doctor-y face) So, what brings you in here today? Me: In here? In this restaurant? Me: Well, I’m pretty hungry. Him: Hmmm. And how long has hunger been a problem for you? Me: Um, a few hours now, I guess. Him: I see. And have you had this problem before in the past? Him: How often does the problem recur? Me: Pretty much every day. Him. Interesting. So how do you usually deal with this problem? Me: Usually? I eat something. Him: Ah. And how does that work out for you, usually? Me: When I eat something? Him: Yes. 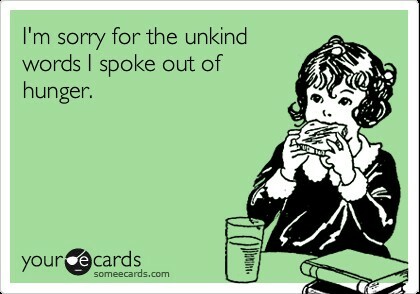 What does that coping strategy generally do for your hunger problem? Me: Um. Generally I’m not hungry anymore after eating. Him: I see. Very interesting. Him: But you say the problem returns again soon after? Me: Sometimes several times a day. Him: Ah. So this is a chronic condition for you. Him. Hmm. So what about your family history? Him: Yes. Has hunger been a problem in your family? Historically? Me: Well, yeah. I’d say everyone in my family has suffered from hunger at some point. Him: I see. So it’s quite pervasive. Him: Well, I have some ideas about what this could be. Him: But I think I’ll have to order some labs first. You can tell he’s a doctor…. I’ve been using the “My Fitness Pal” app on my phone to try and diet… I mean MAKE A POSITIVE LIFESTYLE CHANGE. Otherwise known as: Trying not to eat so much dang FOOD. First of all, I’ve discovered that this app IS NOT MY PAL. Dieting… I mean, “limiting my calorie intake” has made me rather testy of late. In fact I’m getting… HANGRY! Hangry is Hungry plus Angry. This is the feeling you get when you are having to wait a long time to eat, and EVERYTHING is getting on your nerves. P.S. If you’re wondering,about yesterday’s cookie recipe: Yes, I did eat one (or two) Oreo-stuffed chocolate-chip cookies. But I confessed to my Fitness Pal right away. Honest! How do you stuff an Oreo inside a cookie? Yesterday I made Oreo-stuffed chocolate-chip cookies. I will put the recipe below, but first of all, to answer the question. How do you get the Oreo INSIDE? Basically you make the cookie dough with extra flour so it holds together well, and mold the cookie dough AROUND the Oreo. Form it into giant dough balls. You see? Add butter and sugars to the bowl of a stand mixer. Beat until light and fluffy. Then add the eggs and vanilla and beat until combined. In a large bowl, sift the flour, salt, and baking soda with a wire whisk until combined. Slowly add the dry ingredients to the wet ingredients and mix until combined. Add the chocolate chips and mix until combined. Use an ice cream scoop to place a scoop of cookie dough on top of an Oreo cookie. Place another scoop on the bottom of the Oreo. Seal the edges together by pressing and cupping the dough in hand until the Oreo is completely enclosed. Shape into a thick patty. Repeat with remaining cookies and dough. Place the stuffed cookies on the prepared baking sheet a couple of inches apart and bake for 11-15 minutes, until the cookies are cooked through. Let cool for 5 minutes and transfer to a cooling rack. Posted on February 19, 2014 April 5, 2017 Categories FoodTags dessert, recipe1 Comment on How do you stuff an Oreo inside a cookie? Last weekend I went to my first audition in nine years. I don’t know how that much time got away from me between shows. I have always loved performing in live theatre, but life can get in the way of art. In other words, when you have five children it can make it difficult to pursue any type of … Well, it can be difficult to DO anything else at all. Also since my husband has been active duty in the military we have to move around quite a bit, which makes things tough as well. But when I saw that a local theater was holding auditions for the musical, “Showboat,” I decided to try out. When I arrived at the theatre there was quite a crowd.There was an older lady holding court who claimed to have been in the VERY FIRST production at that theatre, in the 60’s with Bette Midler! “She was kicked out if the company,” the woman confided. “She wouldn’t stop stealing focus! The director warned her, but…” She trailed off ominously. Well, that puts Bette in HER place, doesn’t it? Everyone nodded sagely in agreement, glancing apprehensively at the door we would all soon be called through,when our turn arrived to be viewed by the director. When my turn finally came I proceeded quickly (One wants to appear prompt! check.) into a room that had been set up American-Idol style with three people behind a table and a masking-tape mark on the floor for me to stand on. I smiled accommodatingly and tried to agree to everything everyone said. “Whatever tempo you want,” I told the accompanist. (One doesn’t want to appear to be a complaining diva! check.) I sang my song and then agreed cheerfully to a cold reading. I’m usually pretty good at cold readings (reading aloud from a script you’ve never seen before) but there was a twist. “Sure!” I lied with alacrity, trying frantically to remember what an Irish accent even sounded like. The only thing I could think of was the elf from the Lucky Charms cereal commercial. I read the piece while mentally repeating , “Always after me lucky charms,” to myself. If this were a fiction story I was writing, they would have called me and offered me a star part. Unfortunately, this was reality. They did not call. I did not get a part, star or otherwise. And I hadn’t gotten called back. So you win some and you lose some, right? My friend sent me a pin about cleaning the microwave. Easy way to clean your microwave – heat a bowl of water and vinegar for 5 minutes, the steam will dissolve stuck on stains. Simply wipe off. Genius!!!! 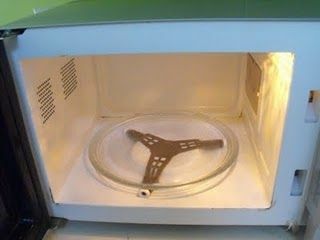 Now I’ll admit that my microwave isn’t the cleanest on earth, so I tried this. It worked pretty well, although it made the kitchen smell too vinegar-y. I think plain water would have been just as good. “Put a paper towel on your Beefaroni, kids…. We have reached 100 days! Yesterday was the hundredth day of kindergarten and the twins were very excited. We’d finished their projects over the weekend, so I went ahead and sent the display boards in to school on Monday. Grr. This is why I don’t like having them in separate classes. Anyways, they had their 100th day party and came home full of talk about it. Then I looked in Little Boy’s backpack and saw that HIS PROJECT WAS STILL IN THERE!! GACK!!! That’s why I gave it to you a day early!! Posted on February 5, 2014 February 5, 2014 Categories KidsTags school, twinsLeave a comment on We have reached 100 days!